Lajtha, László | Symphonie «Les Soli» for string orchestra, harp & perc. László Lajtha was the greatest Hungarian symphonist and generally one of the most significant composers of orchestral and chamber music of his time. He entered the Budapest Music Academy in 1908 to study composition with Viktor Herzfeld (1856-1919) and Zoltán Kodály (1882-1967). In 1909, he went to Leipzig to study the music of Johann Sebastian Bach., and in 1910-11 he was a student of Liszt’s pupil Bernhard Stavenhagen (1862-1914) in Geneva. He was inspired by Béla Bartók and engaged himself in field research of the native traditional music of Transylvania. And he was encouraged by Bartók to go to the Paris Schola Cantorum where Vincent d’Indy (1851-1931) became his teacher in these formative years 1911-13. In 1913, his first composition «Des écrits d’un musicien» (nine fantasies for piano) appeared in print. During First World War he voluntarily served as an artillery officer and was seriousl wounded twice. In the early 1920s the friendship with Bartók became intense. Lajtha consciously merged the achievements of his Parisian education with Hungaran idiom and Eastern European influences. In 1923 he wrote the first of his ten string quartets, and with his Third Quartet he won the Coolidge Prize in 1929; it was printed by Universal Edition in 1931. In 1932 the publishing house Leduc in Paris (later his regular publisher) started a collaboration with Lajtha. He was director of the open university of Hungarian Radio from 1935 to 1938. In 1936, he worte the first of his nine symphonies. His works were more an more regularly played outside his home country. Lajtha became music director of Hungarian Radio in 1945 and director of the National music school society in 1947. Until 1948, his music was regularly performed in Hungary. In that same year, he signed an exclusive contract with Leduc in Paris. But in 1948 he returned to Budapest without his two sons who had decided to leave the communist Hungary behind. He was immediately dismissed from all his posts and performances of his music were banned. His passport was confiscated and he had to stay in Hungary while his music became increasingly successful in the West. In 1955, Lajtha was elected successor of the late George Enescu as a member of the Académie Française on recommendation of Florent Schmitt. Famous conductors such as George Szell (1897-1970) or Adrian Boult (1889-1983) programmed his music. In 1956 Lajtha suffered a first heart attack. After fourteen years he got his passport back in 1961. He was finally able to see his sons again (and to get to know his grandchildren) and conducted the première of his Eighth Symphony in Paris in 1961. In 1963 he died suddenly after a second heart attack. Apart from the Third String Quartet Op. 11 (1929) and the Third String Trio op. 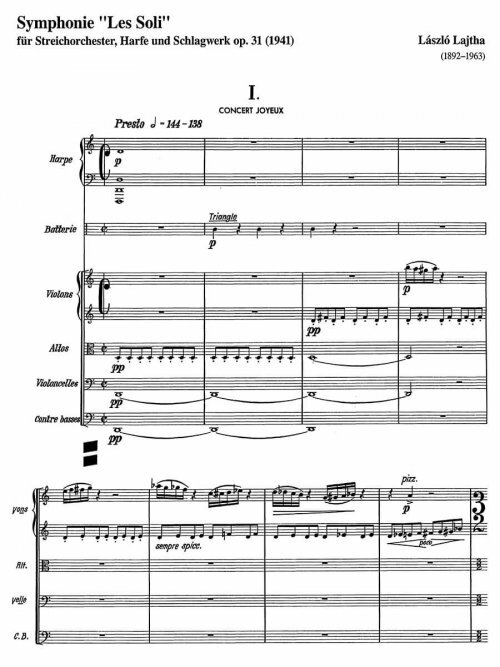 41 (1945) there are only two works by Lajtha that were published by Universal Edition, and both were composed in 1941: the present Symphony «Les Soli» for string orchestra, harp, and percussion op. 33, and the tone poem «In memoriam» Op. 35. Symphonie «Les Soli» is not counted among Lajtha’s nine symphonies for large forces. It was written between the Second (Op. 27, 1938) and the Third (Op. 45, 1948) Symphony. After Symphonie «Les Soli» wrote two further highly virtuosic works for string orchestra without additional instruments: the Sinfoniettas Op. 43 (1946) and Op. 62 (1956) that are both shorter, each of them comprising three movements. Symphonie «Les Soli» presents even more extreme challenges for the performers. The solo parts for viola, cello (with marvelously delicious glissandi) and first violin call for high rank virtuosos, and the whole work can only be performed successfully by an ensemble of exclusively first-rate performers. 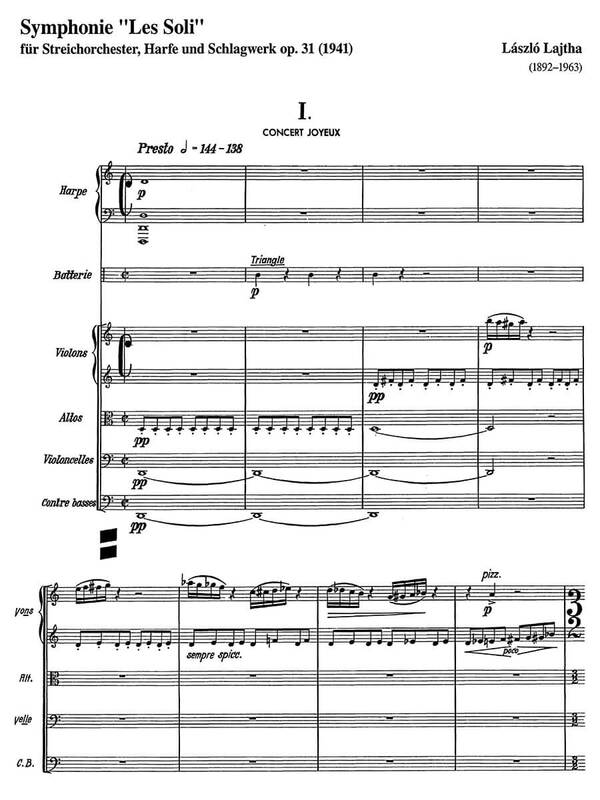 In its brilliant elegance, supreme stylisation (2nd movement Minuet), chromatically entwined counterpoint (3rd movement) and its esprit that culminates in unleashed ferocity Symphonie «Les Soli» ranks among the most significant string orchestra work of its epoch, on a par with Bartók’s Divertimento – if it is performed adequately. After the war, the Hungarian Radio Symphony Orchestra under Viktor Vaszy (1903-79) gave the first performance in a radio broadcast. The first performance outside Hungary was given by the Orchestre National de France under Gaston Poulet (1892-1974) in Paris on 11 September 1952. Full score and parts were published by Universal Edition in Vienna in 1955. In 2014, Budapest Music Center Records released the première recording of Symphonie «Les Soli», performed by the Budapest Chamber Symphony under Simone Fontanelli (b. 1961), together with the two Sinfoniettas (BMC CD 189). The present edition is a faithful reproduction of the 1955 first print, herewith available for the first time in study size format. 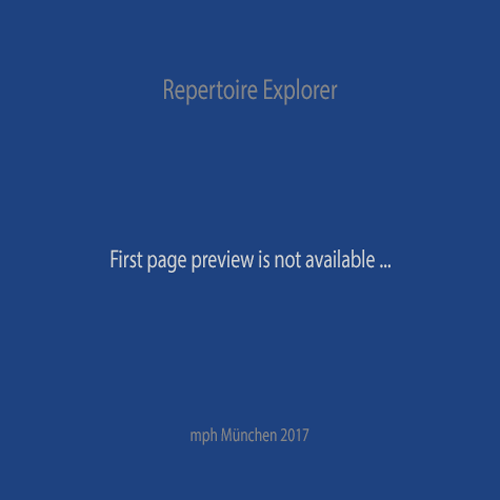 Performance material is available from the publisher Universal Edition, Vienna (www.universaledition.com). Reprint by kind permission of Universal Edition, 2018.